Drink wine while helping (big) kitties at the same time? What else could be better? Big Cat Rescue in Tampa, FL is a nonprofit charity dedicated to the care of more than 100 exotic cats. Their mission is to provide a permanent home for the wildcats in their care, and to educate the public in order to eliminate the causes of abandonment and abuse of these beautiful animals. 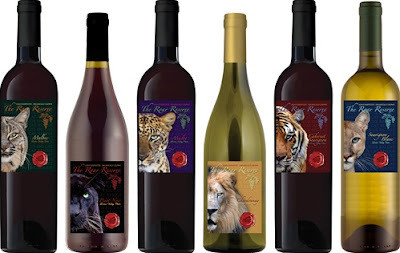 In order to help raise funds for the cause, BCR has teamed up with Benefit Wines to offer The Roar Reserve, a selection of libations that includes Chardonnay, Merlot, Malbec, Sauvignon Blanc, Pinot Noir, and Cabernet Sauvignon. Each bottle of the certified organic, vegan friendly wine features a picture of one of the sanctuary's wild residents on its label, with $7.00 of the $19.99 sale price going directly to the rescue organization. So whether you enjoy a good red wine or white, think about helping out some big cats in need before filling up your next glass! That is awesome!! I would buy those for the bottle alone even if the wine was awful. I agree with Julia. Fantastic idea, I wonder if the wines are available in Canada? umm. how did I - queen of wine - not discover this first! LOL! darn it, online only! Oh well... guess she'll have to just wait out the delivery time *sigh* So much for dinner tonight, MOL! I've been to the Big Cat Rescue place and it is truly amazing what these people do. The stories of the big cats are rescued are sometimes sad. Like people who think it would be cool to have a big cat for a pet or people who get them for some kind of entertainment purposes. This a a GRRRRREAT cause to support!!! I'm ordering some!